I sat on a crowded subway surrounded by people sneezing and coughing the other day and thought, “yup, it’s definitely cold season.” It’s almost unavoidable this time of year no matter how often you wash your hands. But if you take care of yourself, riding through a cold might not be so bad. 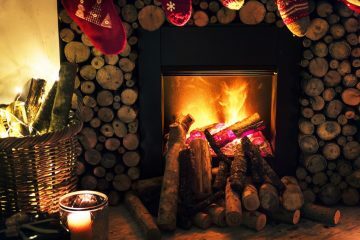 So, don’t be too hard on yourself and have a few things ready to give yourself some TLC. 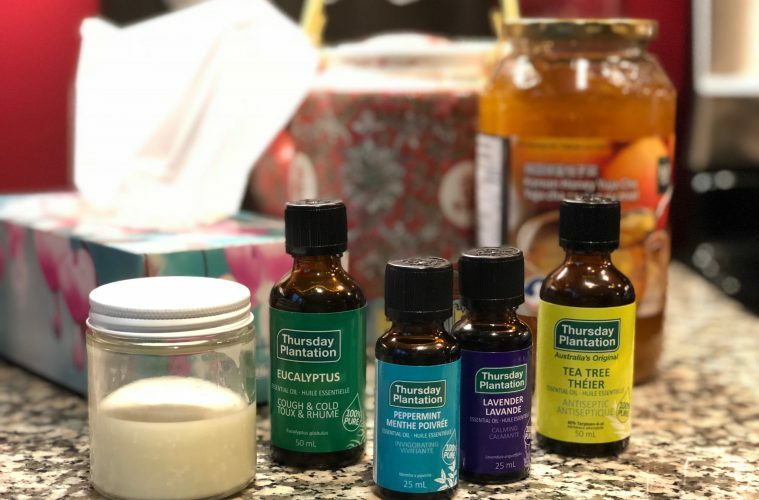 Other than having the obvious (honey, lemon, chicken soup, tea), I always have essential oils in my home. I will always find other everyday uses for them. TIP: Get a small spray bottle and add a few drops of eucalyptus oil to water and keep in the shower. It’s great to spray on walls/shower curtains for a soothing steam shower. Seriously, fancy hotels sell this stuff but make your own for a fraction of price! But for cold season, you may wan to have this recipe for an all-natural VAPOUR RUB ready! What is it? Vapour rubs have been around for many years. It was first sold in the 1890s as a treatment for croup and pneumonia. I remember when I was young, my grandmother would tell me to rub this tingly minty balm on my neck and upper chest. This magic balm was soothing. It helped relieve coughs and stuffy noses. However, the balm found on the store shelves (even today) was made with petrolatum, or commonly known as petroleum jelly, and other ingredients such as camphor that we’re learning isn’t the greatest to use. The petroleum substance was originally discovered as a by-product of the oil industry that was found at the bottom of oil rigs. It’s thick and water resistant. Of course, when the substance is processed for skin use, the bad stuff is removed (how much of it? We’ll have to look that up but Health Canada has approved the commercial brands on the store shelves). But it’s interesting to learn petroleum jelly doesn’t actually moisturize you skin, but acts as a barrier to protect the skin. So, is it the best choice to put on our bodies? Personal choice, really. We’re really not here to preach but really to discover what else is out there. Heck, we’re learning along the way, too! Back to the vapour rub! 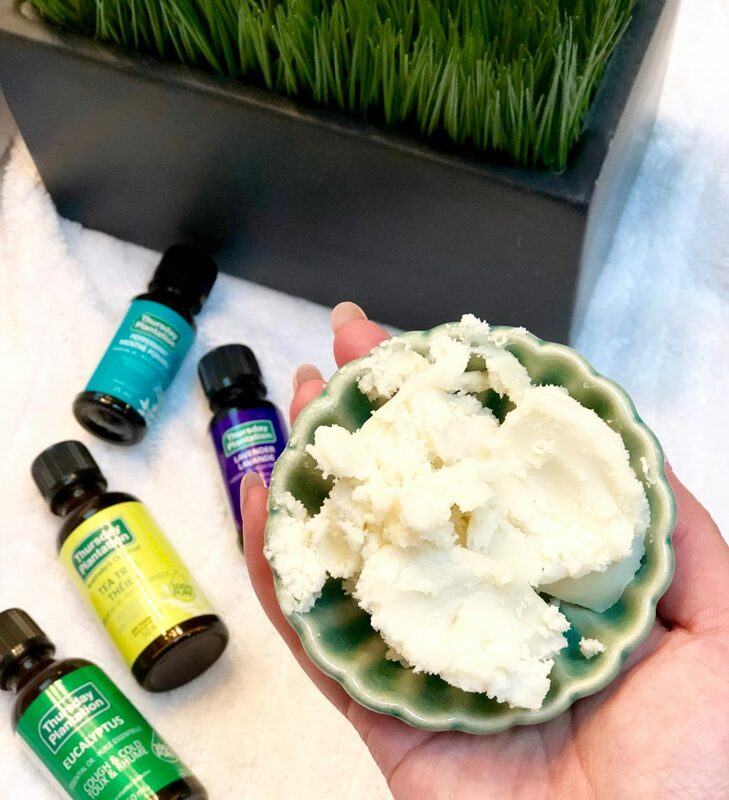 I discovered this DIY Recipe that uses all natural products like pure Shea Butter and Essential Oils. The Shea Butter I found reasonably at my local independent drug store. It’s a pure shea with no added ingredients and it doesn’t have a scent which is what you’ll want. The Essential Oils are by Thursday Plantation and are my go-to’s. This recipe is super easy! Not only will I keep it handy for this cold season but the rub is also great for dry skin on hands and feet as well as your nails! Shea Butter goes a long way so you won’t need much — unless it’s cold season, then slather it on your chest. 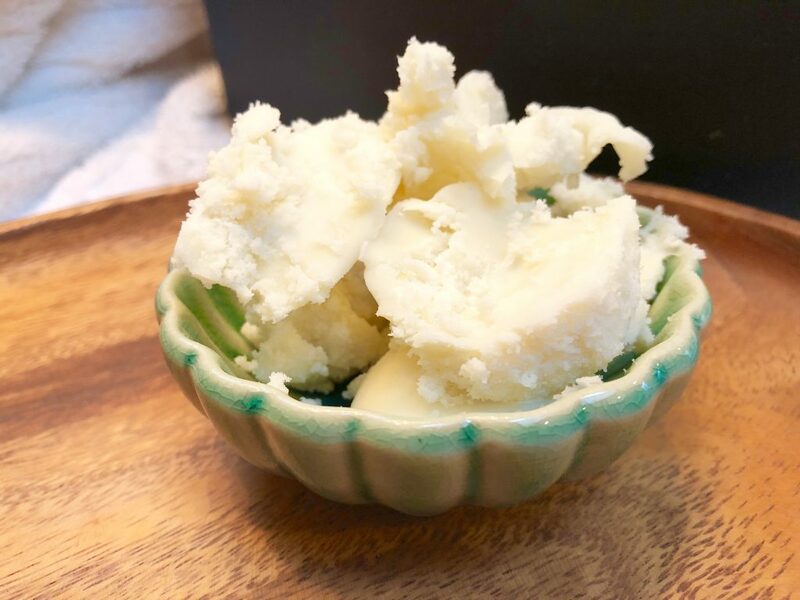 Melt the half cup of the Shea Butter by placing in a bowl inside a sauce pan of hot water over low heat. Stir to a liquid melted consistency. Remove bowl from heated water. Once the Shea Butter is melted, add the oils one scent at a time, mixing each thoroughly. If needed, return the mixture to the heat to keep it easy to mix. Once you have thoroughly mix the oils into the base, let it cool, just enough to test on your skin. Smell and test the batch on the inside of your wrist. FYI Everyone has different skin sensitive. If mixture is too strong for your skin, blend in more of the Shea butter to dilute. If it doesn’t smell strong enough add one more drop of each essential oil until you reach the strength you desire. (However, keep the baby recipe as is). Mix thoroughly and pour finished mixture into a glass jar or container that can be tightly sealed. Let cool to room temperature before closing the lid. Once the mixture has completely cooled it will appear in the butter creamy stage. Store at room temperature for a month for optimum use. *Full disclosure: Thursday Plantation provide me with the recipe as well as the essential oils — although, as mentioned, I’m already a long time user of this line. And they knew that as well. You can learn more about them by linking here.